The 1998 New York Jets season was the 39th season for the team and the 29th in the National Football League. The team improved on its previous season by three games, finishing 12–4 in their second season under head coach Bill Parcells, winning their first division title since the AFL-NFL merger in 1970; the 12–4 record was also the best in Jets history. This success came just two years after the Jets' 1–15 record in 1996. The Jets earned a first-round bye, given to the two division winners with the best records, for the first time. They defeated the Jacksonville Jaguars in the Divisional round of the playoffs. Their attempt to reach their first Super Bowl in thirty years fell short when they lost to John Elway and the Denver Broncos in the AFC Championship game 23–10. The 1998 Jets are one of only two teams in NFL history to win seven games against teams that would go on to make the playoffs. In the offseason, the Jets signed New England Patriots running back Curtis Martin to an offer sheet. The Patriots had offered Martin, their star running back, a tender deal that would net them a first-round pick and a third-round pick if a team signed him. Jets coach and general manager Bill Parcells, who had left New England two years prior and still harbored some bad blood with the team, offered Martin a very large contract that the Patriots were unwilling to match, further fueling the rivalry between the teams. In addition, the Jets parted ways with veteran quarterback Neil O'Donnell after two seasons and signed another veteran, Vinny Testaverde, to serve as backup to Glenn Foley. Testaverde eventually succeeded Foley as the starter and led the Jets to their division title. On defense, New York added former Miami Dolphins linebacker Bryan Cox. The offseason also saw the first major overhaul of the Jets' uniforms and logos since 1978. 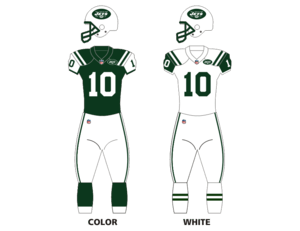 The team changed its primary color from kelly green to hunter green, eliminated black which had been added in 1990 as a trim color, and abandoned the solid green helmets with the modern "JETS" wordmark in favor of white helmets with two green parallel stripes down the center, as worn from 1965-77, but with a green facemask. The new primary/helmet logo resembles the 1965-77 version but is oval rather than football-shaped and has a somewhat "cleaner" appearance, with starker lines defining the word "JETS" in thick sans-serif italics in front of the "NY" in serif outline lettering, and the miniature football at bottom center. This logo was also added to the jersey front, by the player's left shoulder. The jerseys and pants also resemble the 1963-77 uniforms, with alternating shoulder stripes, opposite-colored sleeves and TV numerals, and two green parallel stripes from hip to knee on each side. ↑ Pro-Football-Reference.com: In a single season, from 1940 to 2011, in the regular season, team won game, in games against playoff teams only, only in games against teams with winning record for season, sorted by most games in season matching criteria.